The Anti-Defamation Commission has condemned a new round of homophobic flyers that have reportedly been distributed in Adelaide during the first week of the federal election campaign. 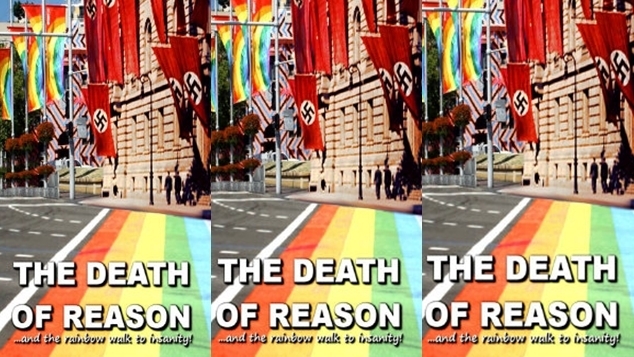 The flyers titled The Death of Reason have appeared several times over the last few years in Melbourne, Adelaide and Canberra. They have previously been traced back to Adelaide street preacher Kevin Bickle. The flyers were said to be found in the Adelaide suburb of Tonsley, attached to people’s cars and in letter boxes. They were inside envelopes stamped with “The Rainbow of Reason”. The flyers include imagery of a rainbow cross work photoshopped with a Nazi flag. The flyers accuse the LGBTIQ community of creating a ‘cult like’ coming out culture where young people are encouraged to stop valuing their own privacy, and instead make declarations of “unnatural and abnormal behaviour”. Dr Dvir Abramovich, the Chairman of the Anti-Defamation Commission, a civil rights organisation, said the flyers were deplorable. “We deplore, in the strongest possible terms, this ugly vilification and incitement against the LGBTIQ community. That such extreme anti-gay rhetoric has invaded the homes of residents in Adelaide, pushing its toxic agenda of hate and abusing the Holocaust to vilify the LGBTQI community, is a matter of grave concern. “Imagine the fear and intimidation a young person would feel after being confronted and targeted by such heinous slurs. It is also appalling that these agents of bigotry are twisting the teaching of Christianity in service of their warped ideology. “Such repulsive language and unconscionable demonisation, when unchecked, can escalate into violent behaviour. No one should ever targeted by because or sexual orientation, and these flyers have no place in Adelaide.” Dr Abramovich said.